5th-Jul-2016 09:22 pm - I'm back!! I've been away from Live Journal for over two years. That is just sad. I have missed it and you. So, as a birthday gift to myself, I am allowing myself to indulge and schedule time for writing and being back where it all started for me. I still haven't figured out the picture thing so my entries will still be blah and boring. My tutor hasn't given up on me yet so maybe I'll be able to figure everything technology out. Maybe! 1st-May-2014 01:18 pm - Comic Con! I am sosososososo excied! Leaving in about 20 hours for my very first comic con. Its a Wizard World Con and being held in Minneapolis, MN. Sean is scheduled to be there Saturday and Sunday. There are several other "big names" I am hoping to see depending on the crowds. My goal: survival. 3rd-Nov-2013 06:33 pm - Happy Seanday!! 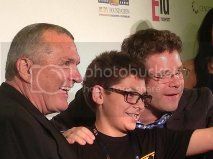 I was blessed enough to attend the 20th anniversary of the movie, "Rudy", in Las Vegas on October 17th. It was so very, very much fun!! It was my first time to actually meet Sean and he was such a sweetie. I only had a few minutes with him but in those few minutes I received 2 hugs, a gift (! 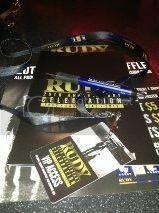 ), 3 autographs (1 more than I asked for) and Sean introduced me to Rudy! Then Sean told the story of why he hates the picture of himself that is on the DVD and cover. The event was a fundraiser for the Rudy Foundation that provides support and scholarships to children in the areas of education, sports and the performing arts. I have a few more pictures that I will post later. Currently they are AWOL on my system. There is also a short video clip that I hope to figure out how to post. It is just so funny!! It was a magical evening - my "first time" with Sean!! Music:What does the Vox say? Can someone please tell me how I go about finding a beta? I really have no clue but I need one. I would prefer to have someone who is willing to work "long term" with me as I have a couple stories (S/E slash) that I want to finish. Any suggestions would be welcome. Thanks!! 3rd-Aug-2013 08:36 pm - Well, I just don't know! 21st-Jun-2013 02:32 pm - Happy Birthday to Belleferret!! It's been awhile since I've been on Live Journal but life beat me up and kicked me to the curb at the end of 2012. I got slammed by a huge work project at one of my jobs that wrapped up right before Christmas. Then I got sick right after Christmas through the New Year! Hope everyone had a wonderful holiday season and let's hope 2013 is grand for all of us!! It's that time of the year again :D where we are entering the birthday season! I am supporting the #Loyals with the sending of birthday cards to Sean. Shhh! It is a secret and we're hoping everyone will participate!! Please check out the link for the particulars. Hoping everyone decides to pitch in. We've gotten so much joy from our boys and it is sweetly wonderful to get a chance to tell them Thank You. This is your chance to get that message to Sean. I am a Sean/Elijah fan girl. No ifs, ands or buts about that! And I rarely make fic recs but I wanted to make sure that everyone knew about Astra Plain's newest....she is following up "Broken Toys" with another story and is on Chapter 9 with "Broken Toys - Scattered Pieces". The original story, "Broken Toys", is a Faculty/Toy Soldiers crossover that takes place a few months after the events of both movies. It is a 3 way romance between Casey, Zeke (from the Faculty) and Billy (from Toy Soldiers) and how they deal with and cope with their horrific events (alien invasion and terrorist take over of the school respectively) seperately and together. "Scattered Pieces" starts off shortly after the events of "Broken Toys". It is a wonderful story! Please give it a read! Personally, I just love those boys!! http://astraplain.livejournal.com/ is the link. But since I have atrocious computer skills, don't come crying if I accidently send you to Nowheresville!! There is going to be a LOTR EE marathon and Twitter fest on December 1st and you don't even have to leave your couch to participate! For more information, please see under the cut!! Well, at least I am trying to stick it under a cut. If it doesn't work, then forgive me. I have abominable compuer skills. Wishing a very Happy Birthday to Ink Gypsy!! Hope your day is as special as you are! !